In the example that goes through this tutorial (voronoi_basic_tutorial.cpp) we are going to construct the Voronoi diagram of a few points and segments. On the image below one may see the corresponding rendered Voronoi graph. The primary Voronoi edges are marked with the black color, non-primary with green, input geometries have blue color. We split each input segment onto three sites (segment itself and both endpoints), edges that go between the sites corresponding to the same segment are considered to be non-primary. It's also possible to use the native Boost.Polygon types as point_data and segment_data, that won't require the above mapping. // This is convenient way to iterate edges around Voronoi cell. // This is convenient way to iterate edges around Voronoi vertex. This should give a very nice idea on how to do the Voronoi diagram traversal. Notice that while the output from the first two methods should be the same, it wouldn't for the third one. The reason is that in the last case we will iterate only once through the edges with a single finite endpoint and will skip all the edges with no finite endpoints. using DFS or BFS on the Voronoi graph requires to mark visited edges/vertices/cells. We will consider the first example and will associate the total number of incident edges with each cell. Note: Each Voronoi primitive contains mutable color member, that allows to use it for the graph algorithms or associate user data via array indices. // of edges around each cell (including secondary edges). As explained in the Voronoi diagram section, Voronoi cells don't contain coordinates of the input geometries directly. Instead they contains source index and source category that uniquely identify input site. The below routines traverses over the all Voronoi cells, fetches input geometry corresponding to the Voronoi cell and prints coordinates of the input site. 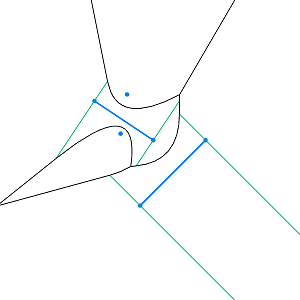 Some of the Voronoi edge are parabolic arcs, so should be discretized. Note: This would be the issues not only for rendering tools. Basically every task that requires diagram to be represented as a set of finite segments will fall into this category. voronoi_visualizer.cpp contains a simple fully featured implementation of the Voronoi diagram renderer using the Qt libraries. It was used to generate all the .png drawings under the boost/libs/polygon/example directory. I hope the reader managed to get to this point and found the basic tutorial to be useful (in the end it's not so basic). Worth to notice that construction of the Voronoi diagram takes only two lines of code, everything else is about initializing input data structures, traversing Voronoi graph, associating data with the diagram primitives. In the default mode the Voronoi diagram operates with the signed int (32-bit) input coordinate type and double (64-bit) output coordinate type. In the advanced Voronoi tutorial we explain why this is enough for the 95% of cases and how to expand the algorithm coordinate types for the other 5%. Copyright � Andrii Sydorchuk 2010-2012.